The following tips require very little effort but can have a big effect on the health of your tomato plants and the quality and timing of your harvest. This type of tomatoes are often called “bush tomatoes". Determinate varieties grow in a compact, tidy form and the branches terminate (stop growing) at the same distance from the stem, ending in flower buds, followed by the fruit. They usually reach a height of around 4 feet (1.2 m). Determinate plants produce all their tomatoes at one time and are preferred for canning since the majority of the tomatoes can be harvested at the same time. 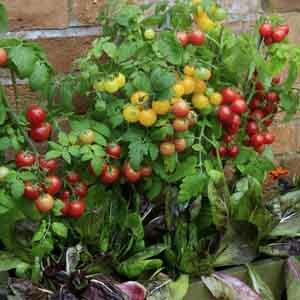 This type of tomatoes are often called “vine tomatoes" because of their sprawling habit. Plants continuously sprout new leaves at the branch tips. 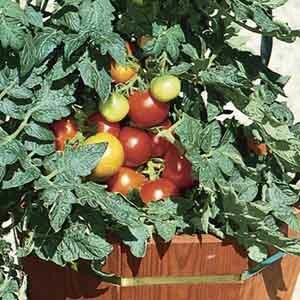 This type of plant produces new flowers and tomatoes throughout the season. They don't stop until they are killed off by frost. Pro-Tip: Cage or stake as soon as you plant your tomatoes, before the roots start to establish themselves in the area you will be staking. Disturbing the soil near an established tomato plant can damage its root system and affect the productivity of the plant. Due to their tidy growth habit, determinate plants are better suited to cages because they need only minimal support. Common cage sizes are 42 inches (106 cm) or 54 inches (137 cm) tall; constructed of thick galvanized wired shaped like an inverted cone. Set cages 2-3 feet (.6-1 m) apart for “bush tomato" plants. Pro-Tip: Look for wire cages coated in colorful plastic to add a bit of whimsy to the garden. Because of their trailing habit, indeterminate plants can grow 6-8 feet (2-2.5 m) tall, keep that in mind when planning for their support. Traditional staking styles are a “teepee", a “box", or a single pole. With each style, the structure should be 6 feet (2 m) high and constructed of sturdy 1-inch x 2-inch (3 cm x 5 cm) lumber for the main supports. Stakes should be set in the ground at least one 1 foot (30 cm) deep for stability. In general, set plants 2 feet (60 cm) apart. Plants need to be loosely tied to the supports. Use strips of cloth, old pantyhose, or commercially available clips or plant ties. The key word is “loosely", as the material should not cut into the vine or girdle the plant as it matures. Tomato plants can produce suckers at the point where leaves join the stem. These stem suckers deplete the plant of nutrients and should be removed. Removing suckers also opens up the plant. Increasing light and air circulation reduces the chance for disease. Simply pinch suckers off at the main stem when they are small. Some gardeners will top off the indeterminate plant a month or so prior to the first frost in autumn. Removing the top 4 inches (10 cm) of the main stem will help slow down plant growth and focus all of the plant's energies into the development of the ripening fruits. Pro-Tip: Pruned tomato plants tend to produce fewer tomatoes, but the fruits that result will be larger, healthier and earlier. Supports the plant and the fruit. Fruit is easier to harvest. Efficient use of your garden space. Visually appealing neat and tidy garden. Plants and fruit off the ground, reducing fruit rot and insect damage. You can’t go wrong with anything that has cream cheese and this recipe is no exception, add in the shrimp and tomatoes and you have the perfect party appetizer. This great recipe provides the perfect blend of tangy tomatoes and mellow feta cheese.